myITforum.com : SMS/SCCM Command-line Actions. 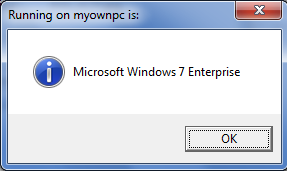 The script below is simple – use it to get the name of the current OS (Windows XP, 7, etc). Currently it outputs to a message box but can be used for case statements, if else, etc.